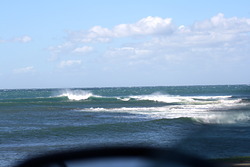 Little Makaha in Sydney North is an exposed reef break that has fairly consistent surf. Winter is the best time of year for surfing here. Ideal winds are from the southwest. 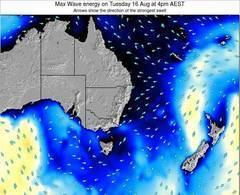 Tends to receive a mix of groundswells and windswells and the best swell direction is from the southeast. A right hand reef break. Good surf at all stages of the tide. Relatively few surfers here, even on good days. Watch out for urchins, rocks and sharks. For Dee Why, 3 km from Little Makaha. At Sydney Waverider Buoy, 8 km from Little Makaha. At Sydney Waverider Buoy, 5 miles from Little Makaha. The closest passenger airport to Little Makaha is Kingsford Smith International Airport (Sydney) Airport (SYD) in Australia, 27 km (17 miles) away (directly). The second nearest airport to Little Makaha is Sydney Bankstown Airport (BWU), also in Australia, 37 km (23 miles) away. Newcastle Airport (NTL), also in Australia is the fifth nearest airport to Little Makaha and is 115 km (71 miles) away. Esta é a página de Surf-Forecast para Little Makaha, NSW - Sydney North Coast. Use a aba navegação acima para ver temperatura do mar em Little Makaha, fotografias de Little Makaha, previsões detalhadas do swell em Little Makaha, previsões do vento e do tempo, webcams em Little Makaha , vento atual em NSW - Sydney North Coast com base em dados ao vivo fornecidos por estações de meteorologia e previsões da maré em Little Makaha. O link para os mapas do swell em Australia abrirá uma imagem ampliada monstrando Australia e os mares próximos. Estes mapas do swell podem ser animados para mostrar diferentes componentes do swell, energia das ondas, período das ondas, altura das ondas, assim como previsões do vento e do tempo, observações em tempo real do estado do tempo e do mar graças às bóias de Australia, navios passantes e estações de meteorologia presentes na costa. Cada uma das páginas de previsão para este surf break apresenta as ferramentas do buscador global e regional para localizar as melores condições de surf na área ao redor de Little Makaha.